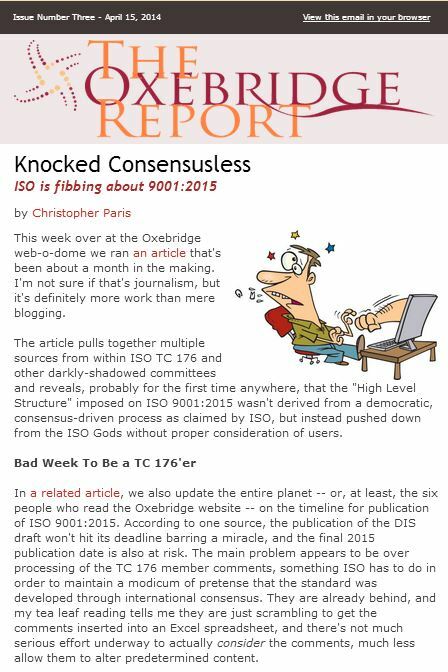 Published entirely randomly about every two weeks, The Oxebridge Report includes brief content otherwise not available on the Oxebridge website, including editorials, latest news and links to interesting items related to the ISO world of management system standards and quality management. The Oxebridge Report email list is a standalone list that cannot be used for spamming, so there’s no worry that you will be added to any other lists. We never sell contact information and will resist all NSA drone attacks with great vigor, to protect your information. We figure you get enough money laundering offers from dubious third world dictators already. If you enjoy the articles here on Oxebridge.com, you’re gonna love The Oxebridge Report. Enter your contact details here and wait for a confirmation email. Your information will not be used for any other purpose, nor sold!